Stockwell Studios would like to thank everyone for their support and interest over the last 26 years. 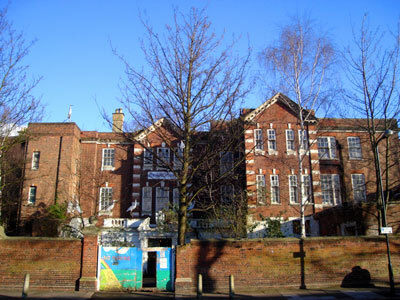 The old maternity hospital and community garden have been sold by Lambeth Council for redevelopment. The storks have flown – the bringers of life, hope and creativity – chased out by the dead-eyed developer-vultures. As local boy William Blake put it; When Nations grow old, the arts grow cold, and Commerce settles in every tree. We leave with great sadness but a debt of gratitude to a building designed for birth that nurtured our creative endeavours and for the tranquility and beauty we shared with the birds, frogs, bees, dragonflies, foxes and other residents of the wildlife garden. Most members are staying together and moving to an Acava studio in Bermondsey and others will be working elsewhere but keeping strong ties with a view to exhibit together and rejoin in the future. 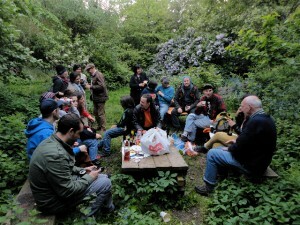 Stockwell Studios’ members and friends have convened one last time on Saturday 18th April amidst many days of frantic packing and studio moves. Stockwell Studios would like to thank those who took the time to read and respond to the planning application submitted to Lambeth for the development of the former Annie Mccall hospital. We have now also archived our petition, thank you to those who signed, shared and helped us throughout these many years. The exhibition brings together contributions from a variety of formats and editions that consider the self in the artist’s book, including: handmade books, sculptural books, altered books, installation books, photobooks, photozines, print-on-demand books, zines and ebooks. On the first weekend of October artists and crafts people across the borough of Lambeth will be opening their studio and work spaces to the public. Doors will be open from 10am to 6pm, 6th and 7th October and admission will be free. Stockwell Studios is one of the exhibitors this year showcasing new work for some of its resident artists. This 3 minute consultation will help us improve our contribution to the local arts community and assess what already is being delivered. Find it here. Lambeth Council are in the process of selling the former Annie McCall Hospital to Henley Homes subject to planning permission. 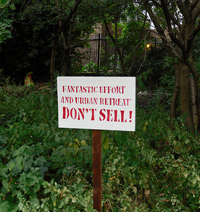 We are very concerned for the future of Stockwell Studios Community Arts Hub and garden. Stockwell Studios artist co-operative are once again fighting to remain in the former Annie McCall Hospital site in, Stockwell, South London. 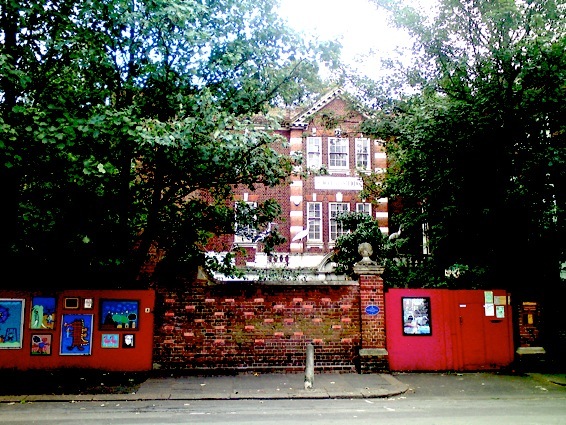 The Lambeth Council owned property is under threat of being destroyed due to pressures on the Council to make drastic cuts in the next financial year. Before the change in Government the council were negotiating a lease with Stockwell Studios if they satisfied health and safety standards for the building, the Studios carried out the necessary works but the council have done a U-turn and put the site up for sale leaving the artists once again with no option but to fight to save the building, garden and their artist community. Almost one in five of capital’s empty homes are in Lambeth, figures show As the Streatham Guardian revealed last week, some 1,090 council homes in Lambeth are currently empty, an increase of 183 homes in nine months. Empty homes in Lambeth are estimated to be costing the housing service £8m a year, which some say has led to soaring rents for the borough’s tenants. I cannot help but be dismayed and underwhelmed by the lack of innovation within the Council and their treatment of us, read our story below. Stockwell Studios is an artist co-operative of 25 artists that have been custodians of the former Annie McCall Hospital in Stockwell, since 1986. In that time the group has functioned as an artists studios, allowing over 200 artists/crafts people/ performers/ instrument makers to work in a creative, uplifting and supportive artistic community. 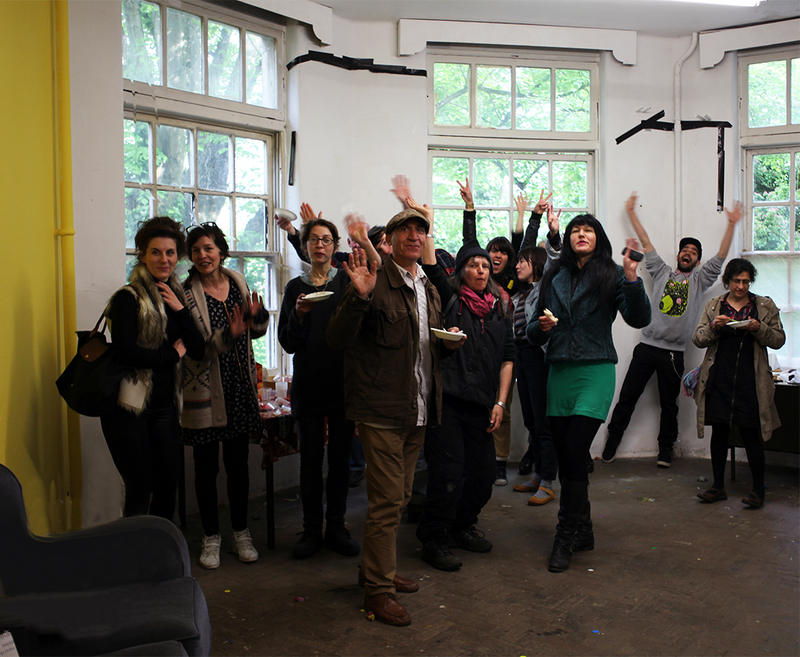 The group have historically held biannual Open Studios and offered an affordable community space for hire to local residents. ( In 2007 Lambeth Council stated we were no longer allowed to hold public events or allow the public into the building on Health and Safety grounds) .Over the past 5 years Stockwell Studios has become more embedded in the local community running workshops and community art projects. The surrounding garden and valuable green space has meanwhile been developed into a rich and fascinating ‘wildlife garden’, thanks to a lot of input from corporate volunteer teams and the artists, the garden is now open to the local community to use and enjoy. In the time that Stockwell Studios have been at the Annie McCall site (owned by Lambeth Council – it was originally funded by the great Dr Annie McCall – and fell into Lambeths hands when it ceased to be a hospital in 1981) there have been various development schemes, which, for one reason or another have never quite worked. The site is problematic in that it is quite small for development and is surrounded by two large estates and residential streets, so more housing is not what that immediate area needs. The last development scheme collapsed in January 2010 after 7 years of discussions and plans moving from saving the building and keeping the community garden to knocking the building down, building on the garden and putting in roof gardens. At this time Lambeth council,because of their renewed insurance liability for the building requested that Stockwell studios vacate the building, on health and safety grounds. 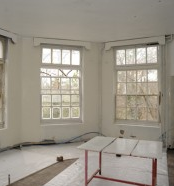 Stockwell Studios hired a health and safety expert and asked the council to provide a breakdown of the works needed to be carried out in order for the artists to remain and function in the building. What started out as a 6 figure amount to carry out the works got broken down thanks to our expert to a more manageable amount and Stockwell Studios members spent £52,000 of their own money and countless man hours and, with the help of some corporate teams, got quite close to completing the list of works. Running parallel to this, the council and Stockwell Studios were in negotiations on a lease offer of 5 years. 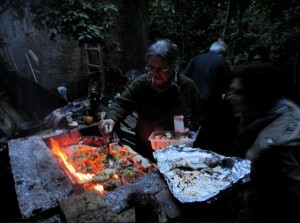 After the summer 2010 with no communication from the council and a change in government, Stockwell studios were getting nervous about their position especially as members had taken out personal loans to cover the health and safety works. 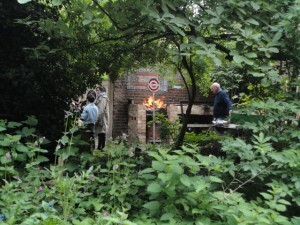 In December 2010 Stockwell Studios received correspondence received communication from the council stating that in light of government cuts and health and safety works not being completed ( the council had not formally inspected what we had done at this point) the council were being force to put the site up for sale. Once again Stockwell Studios were thrown into a state of unrest and uncertainty – shocked by the news and dismayed that once again a fight was on our hands. A marketing package was put together and bids had to be in by 6th June 2011, the package included our contact details and stated that bids which included artist studios and retained the garden would be looked upon favourable. Essentially it’s a numbers game, the council said they need to recoup £40 million in this financial year and unfortunately the Annie McCall site is part of that. Stockwell Studios in partnership with a benefactor put forward a Charitable Finance Initiative which would retain the Studio’s in the main hospital building, the community wildlife garden, the community arts facilities and provide social housing by developing the adjoining houses and 2 front plots giving Lambeth a capital receipt of approximately 3 million pounds and a peppercorn rent. How does this sale fit in with the councils Localism Bill or Cameron’s Big Society? Instead of destroying an artists community the council could work with the artists use their passion for the building and vision to create a vibrant artistic community hub for local residents and the international community; the garden could be developed to provide food growing experience for local residents; the artists and the council could work together to fundraise for the building to bring it to it’s former glory; the artists could provide a programme of workshops; international artists residencies; the building could be renovated using green technologies the possibilities and potential for this site are endless and Stockwell Studios are committed to. Art4Space are finalists for the South London Business Awards 2012 ‘Best Small Business’. The community arts organization was invited lask week to a glitzy award ceremony where they were acknowledged for their determination and hard work. Art4Space have secured funding from the Lambeth Social Enterprise Fund, which is also very exciting. They will be working with consultants to expand their services and community provision. Last Thursday 22nd March 2012 Lambeth Business Awards hosted their Dinner and Awards Ceremony at the Kia Oval Cricket Ground where Art4Space were announced winners for the ‘Best Cultural and Creative Business’ and commended for ‘Commitment to the Community’. A huge success for Stockwell Studios. Thanks for all the support we have gained which supports the passion and confidence we have in Art4Space. 1) ‘Jardin’ with Xavier Jacques. A Capital Growth project where chef Xavier grows herbs and crops for the family cooking club at the Nursery over the road from Stockwell Studios. Seedlings will be transferred to our community garden where the cooking club will be responsible to maintain and cultivate their own plot. The project will reconnect and link families to share this exciting foodgrowing scheme. 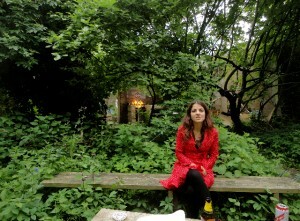 This is a wildlife garden behind Stockwell Studios, home to artists’ studios and a community arts education centre. The artists have been custodians for over two decades of the building which was once the Annie McCall maternity hospital. To date we have beehives, a pond, treehouse, orchard, bog land, a fern and mushroom area, natural wood structures to encourage stag beetles and insects, and a kitchen garden in the walled garden. There is plenty of seating to enjoy the space and relax. The garden is generally open every Tuesday afternoon to the public and the response from local residents has been consistently appreciative of this wonderful wildlife garden. We also host a number of garden events throughout the year. Activities: 25th Anniversary Open Studios Exhibition. 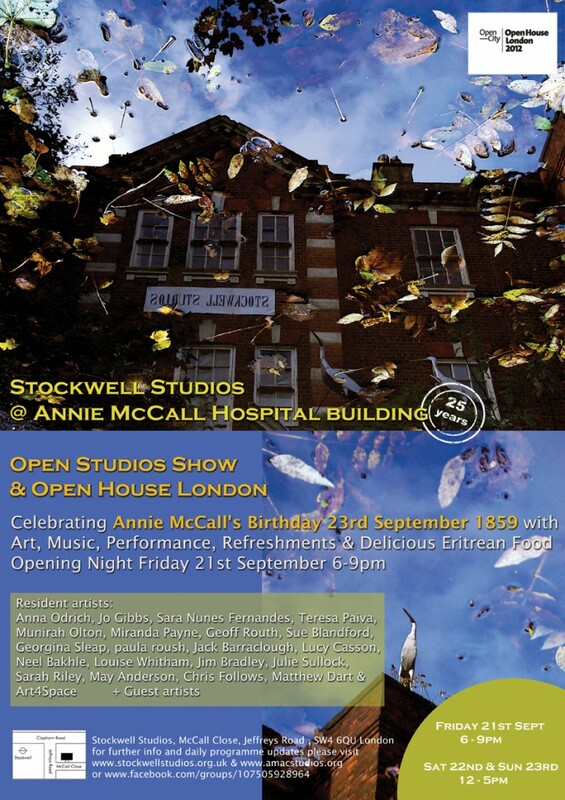 The artists of Stockwell Studios will be celebrating 25 years as custodians of the former Annie McCall Hospital and invite you to their free Open Studios Weekend, where you can view and buy contemporary art from current Studio members and guest artists. The decision by Lambeth in south London has caused particular anger because it came shortly after the artists and charities who use the centre spent £70,000 on renovation work, in exchange for a promised long-term lease. Read more. Please follow this link to read Peter Walker’s article in the Guardian online. ProjectOroom in collaboration with CIA (Creative Intelligence Agency) and Stockwell Studios , invites artists worldwide to submit exciting, thought provoking art work for a Climate Change themed exhibition at Flexi Space – Stockwell Studios London. *Submitted works should be no longer then 10m (including credits). Accepted formats: mov, dv or PAL format only. Artists can submit up to 3 works in total , falling under the categories listed above. Unfortunately the battle is not over yet and our studios are still being marketed by the council. 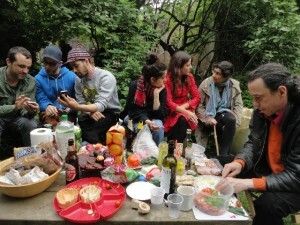 We are once again re-launching FOSS (Friends of Stockwell Studios). Please email us on info@stockwellstudios.org.uk to become a friend of the studios and to keep informed of the latest news. A developer has taken interest in the site and the council is ready to sell. A marketing package was put together and bids had to be in by 6th June 2011, the package included our contact details and stated that bids which included artist studios and retained the garden would be looked upon favourable. Stockwell Studios put in a bid with Charitable Finance Initiative who proposed to negotiate with the council to develop the 4 housing plots to provide housing, a target figure of 1 million pounds or above for Lambeth, to keep the garden and retain us in the hospital, giving us a 125 year lease with pepper corn rent to the council. This proposal has been rejected. We will be convening with the council and selected developer in the next few days to assert our position on site. Stockwell Studios is now a listed Grade II building! Hospital played a vital part in the network of pioneering women doctors in the late C19th, and the growing acceptance of women in the medical profession well into the C20th. State of preservation: there has been little alteration to the building since it opened and it retains its wood floors, terrazzo-paved corridors, original window joinery and one fireplace, which enhance our understanding of how the building functioned. Thank you Judith Martin for helping the studios! 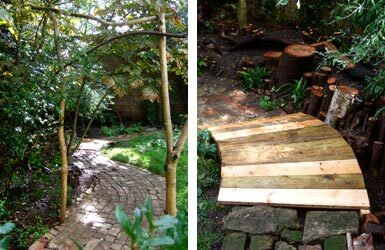 When the secret garden was cleared, Georgian bricks were found and Neel made a lovely pathway around the pond and bog gardens and has since created the slate and fern area and other wood and water areas to encourage wild life. We were very lucky with our frog spawn in the Spring because 10 tiny frogs were spotted huddled under a plastic bag during an Ernst & Young workday when making bird houses and bird seed balls, winter sustenance for the birds. Looking forward to Spring 2012: maybe more frogs, plenty of daffodils, hyacinths and fruit trees to check out, all planted in November with the help of local volunteers and Ernst & Young. 1. Ernst and Young ongoing support: 11 projects to date. (tasks have been listed previously). 2. 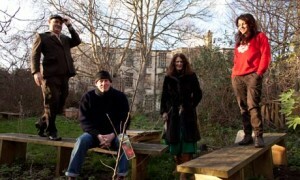 LBKA [London Bee Keepers Association]: Four hives and classes. Awards-Winning honey. 4. Master Gardeners Programme (permaculture group) and helped design kitchen garden. 5. H&S site visit of garden: All documentation in place. 6. 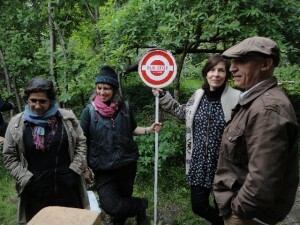 Volunteer artworks (e.g mosaic stepping stones). 7. Kept side gate open for access – separate access creating opportunities for garden initiatives. 8. 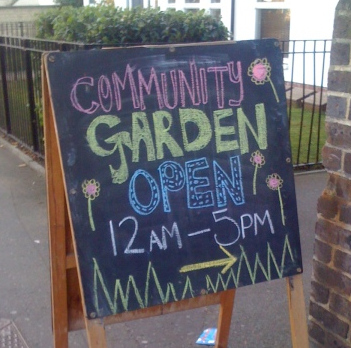 Committed 18 months of the community garden open every Tuesday afternoon (only missed one!). 9. Botanical study done and plant survey by Roy Vickery, Green party. 10. Registered for Environmental arts day – in garden (Art4Space) and Capital Growth. 11. 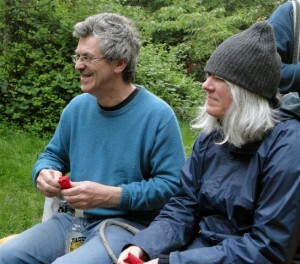 Art4Space art workshops funded – Woodward and HAP – using the garden as educational resource. 12. Young People help with Lambeth. NEET. 13. Art4Space Spring Fair, including incredible edibles. 14. Linked garden with Art4Space volunteer programme, regular help in garden. 15. May and Barbara assisted art/garden programme. 16. Kitchen garden designed by Neel with drawings and plans. 17. Fruit trees donated by local grower. 18. Taken on 2 regular garden volunteers. 19. Pledged protection on websites. 2012 – Art4Space have received a grant from the Walcot Foundation to run training courses in ‘Employability and Community Arts’ starting in January which is such exciting news for our business and it’s development. We have several commissions secured for the Spring. Watch this space! 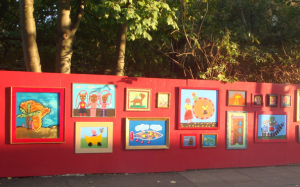 2011 – Completed 12 commissions, many with local schools and housing associations. Successful with 3 funding bids. 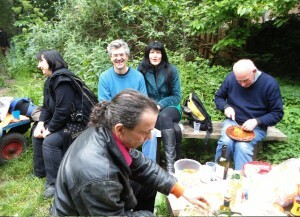 Spring fete in May which was well attended in the garden. We ran a full volunteer programme, trained 2 volunteer placement student for 6 months, an apprentice and 4 work experience. Art4Space ran the participatory arts at Stockwell festival. In October Art4Space were proud to host our well-being event, exploring the therapeutic benefits of creativity and the concepts of happiness and wellbeing. It was a dynamic evening of hugging, singing, meditation, speeches, discussion, chai and cake! A BIG thank you to Nan Fee for leading the singing, Vanessa King ( Action for Happiness), Roy Sutherwood ( Jamyang Buddhist Centre) and Michelle Baharier ( Cooltan Arts). Also a BIG thanks to Majella (Guerilla Hugs) for hugging, Natalie for making the Chai and Anja ( Love Cakes) for her beautiful cakes. A special mention must go to Maren Grotemeier for helping to pull everything together. We hope that everyone who came enjoyed the evening and for those who were unable to make we will be looking to host another similar event in the new year. 2010 – Art4Space moved to the ground floor at Stockwell Studios in June and opened their community arts centre, this has enabled us to have a full volunteer service in place and apprenticeship scheme linked to Lambeth well-being, lvac and Involve. 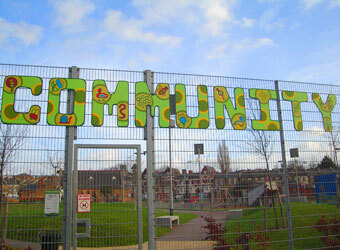 We are currently working on 8 commissions including nearby Stewarts Road Youth Club and Lark Hall Childrens Centre. We have project managed the Elephant Parade London Schools Programme. Elephant Parade is the biggest public art event that London has seen. 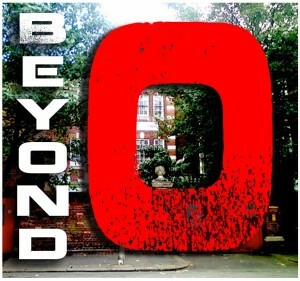 Art4Space featured on BBC London in May promoting the event and the Education Programme. We are also in the process of placing 4 funding applications for outreach projects with Stockwell Studios. We have two further commissions secured for late summer.